Gyoza Machine DEC-100G | Daiei Engineering Co., Ltd.
Gyoza (Pot sticker) machine (Model : DEC-100G) automate a series of processes such as round wrapper forming, stuffing, wrapping and forming, and delivery onto conveyer. Firstly, put the stuffing and as-rolled pastry into the hopper and on the hunger, respectively. 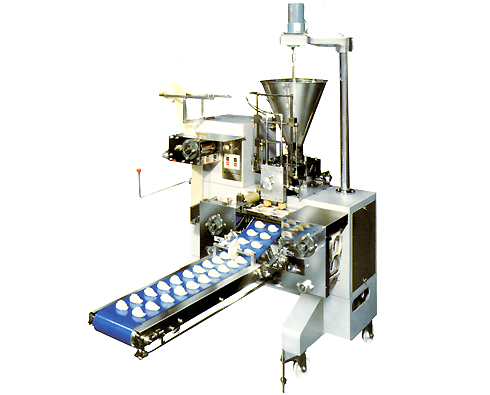 After that, the machine automatically makes round wrapper, fills the stuffing onto the round wrapper, then wraps and forms into Gyoza, and finally delivers on the conveyer.